M/s Kiran Design & Engg. Co.
We are among the reputed organizations, deeply engaged in offering an optimum quality range of Round Mixer Machine. Khwaja Baba Packaging Pvt. Ltd.
Static Mixers for two component mixing available in various sizes and material depending on application requirements. Industrial Double Cone Mixer Machine is used for hydration of guar split with hot water and additives. It is designed in such a way that proper moisture absorption of seeds takes place. Mixer is available in complete stainless steel construction and offers vibration free operation. Leakage proof double cone mixer comes with water inlet valve and needs less maintenance. 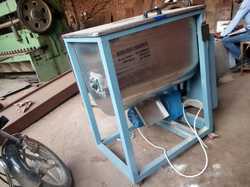 High speed mixer is suitable for mixing solid coarse and lumpish multi component materials. The material will be crushed during mixing. Phoenix Industries And Trading Co.